With so many purchase outlets, differing information, rules and regulations and scare stories, buying tickets for concerts can be a veritable minefield – so here are answers to some common questions to help steady the nerves. The days of concert-goers all patiently queuing up outside a box office booth are long gone. Then a popular show could only ever sell out as quickly as the box office could process the requests. Nowadays there are so many more distribution channels - not only the traditional box office, but also the countless ticket phone lines and internet agencies. A show can sell out in a matter of minutes because literally hundreds of people can purchase tickets at exactly the same time. Why is there sometimes a Limit on the Number of Tickets I can buy? It is not unusual for expected sell-out event to impose a restriction on the number of tickets an individual can buy. This is a measure said to try and provide ticket assess to as many different fans as possible. However, a more pertinent reason for the limit is in stopping ‘touts’ from buying tickets purely to sell on. What’s the Best Place to buy Tickets from? 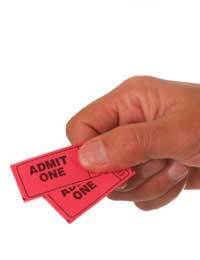 Official ticket agencies should not reserve specific numbers of tickets for its different distribution channels. Therefore it shouldn’t matter whether you order you tickets by telephone or over the internet, the odds on getting hold of them are the same. The official advice is that your first port of call when buying tickets should be the venue box office and beyond that, only buy from the agents listed in the concert advertising. What is the Difference between Official and Non-Official Ticket Agents? Official ticket agents are authorised by the artists to sell concert tickets on their behalf. The public should therefore be reassured they are buying from a reputable source if they approach an official vendor. Some agencies offer a further display of their trustworthy credentials by being members of the Society of Ticket Agents and Retailers. Unofficial agencies have no such reputation and have been known to go into and out of business in the space of a ticket sale. Whereas official agents will always sell tickets at their agreed value – with an additional booking fee – unofficial vendors buy up tickets for sold out events and then exploit desperate fans by charging whatever they think they can get. Ticket buyers should therefore exercise great caution when buying tickets from unofficial agencies or, better yet , just avoid them altogether. Why do I Have to Pay Fees on Top of the Ticket Price? If the ticket is bought from an official agent then its face value will always be the same wherever it is bought. What will change agent to agent are the additional fees they add on to every ticket price. What these fees pay for also varies according to the agency, but might well include paying for the distribution network, telephone lines, staff, anti-fraud measures and installation and maintenance of computer hardware and, if applicable, posting the tickets to you. Basically ticket agencies have to make a profit like everyone else and wouldn’t be able to by selling tickets solely at face value. Is it Illegal to Sell on Second-hand Tickets? Although it is illegal to sell on football match tickets, it is not against the law to resell those for concerts. It is this legal loophole that has led to a thriving but damaging market in secondary ticket sales. It is, however, an offence to sell tickets on the street – such as outside a venue – without the appropriate street trading licence. It is very unlikely that any agent would allow you to exchange, refund, transfer or return tickets unless the event has been cancelled or its timing or location has changed considerably. Nevertheless there are websites that offer face value ticket exchanges. The most noted of these is Scarlet Mist, an ‘ethical ticket-exchange’ which introduces buyers and sellers of second hand tickets to one another.